J.K. Place Capri, Italy ranked #20 in our countdown of the 100 Best Hotels and Resorts in the World. Divine cliff-top hotel on the exclusive isle of Capri. It’s new but has instant star quality. Italian designer Michele Bonan’s bespoke interiors deftly create a world of low-key luxe. Every room is a mélange of crisp whites and Mediterranean blues and sun-washed colours, flashes of ’60s-retro, canopied beds, monogrammed cushions, masses of fresh flowers and a curated art collection. At JKitchen, seafood stars on the menu, but it’s breakfast on the panoramic terrace that you must not miss. Seeking privacy? The penthouse has its own private terrace with views of the shimmering Gulf of Naples. Perfetto! 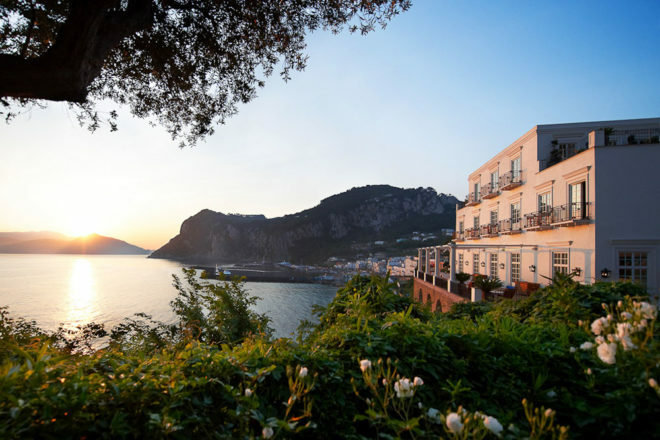 Did you know The J.K. Place is the only hotel in Capri with direct access to the beach.